What the client wants, the executives must implement - so it seems to be the commercial relationship nowadays. Empowerd with decision-making within the company, executives are guided by customer feedback. The disintermediation that the internet and technology have generated has given customers the power to choose, and the information asymmetry that once was for the benefit of the companies has become rather insignificant currently. Because the level of customer-centricity of Romanian companies depends on the company's strategy, the perspective of CEOs on this topic is an essential one. CEOs decide on the strategy while the Financial Directors manage the resources to support the implementation thereof. 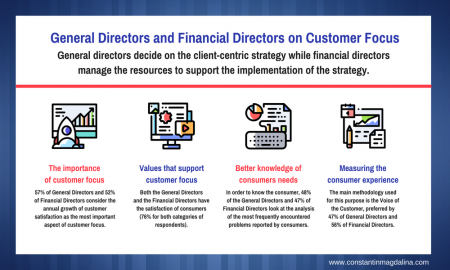 In order to compare the perspective of the CEOs and the Financial Directors, we selected from the Barometer of customer centricity in the Romanian companies the main conclusions resulting from the analysis of the answers received from 145 General Directors/CEOs and 80 Financial Directors. The importance of customer-centricity for the company. The top level of CEOs' importance is the annual increase in consumer satisfaction (57%) and the annual increase in service quality by lowering demand-side times (25%). For Financial Directors the same two issues are the most important ones, but the percentages drop to 50% and, respectively, 24%. Company values that support customer focus. Both 76% of General Managers and 76% of the Financial Directors uphold the satisfaction of consumers as the most important value. Unfortunately, the focus on consumer experience is a priority only for 22% of the General Managers and 21% of the Financial Directors. Even lower is the value given to the retention of consumers, marked by only 29% of the Financial Directors and 22% of the General Directors. Internal actions to increase customer focus. In order to be more customer-centered, the company must focus on creating processes that deliver superior customer service (54%) and training employees to understand the customer-centered approach (52%), say the CEOs. At the same time, Financial Directors prefer actions such as facilitating the cooperation between the company's departments (51%) and rewarding customer relationship performance with bonuses and promotions (49%). External actions to increase customer focus. According to the CEOs, in order to be more centered on the consumer, the company must offer products at prices deemed fair by the consumer (57%) and create an emotional bond with consumers (53%). Financial Directors say it is important to minimize communication with each consumer (38%) but also to reward consumers in the most relevant way for them (28%). The teams involved in budgeting for customer-centric initiatives. CEOs say they involve the sales department (74%), the finance department (72%) and the marketing department (62%). Financial Directors turn to their own financial department team (85%) and then involve the sales team (79%). Still, only 62% of general managers and 71% of financial directors say they have a budget for customer focus initiatives. Methods to budget for customer-centric initiatives. In order for the company to be more customer-centered, CEOs say the budget is put together by aligning departmental targets (37%) and setting up a dedicated budget for customer-centric actions (17%). While Financial Directors (30%) say they prepare the budget by focusing on the "customer lifecycle" (acquisition, retention, loyalty, etc). Actions for better understanding the customer needs. In order to know better the customer needs, 48% of the General Managers look at the analysis of the most frequently encountered problems reported by consumers. For 47% of the Financial Directors, the most relevant is to centralize all product / customer information into one database and then analyse this information. Methods of measuring the quality of consumer experience. For CEOs, the first criterion for assessing the impact of client-centric initiatives is measuring customer satisfaction (72%) while for the Financial Directors is the cost associated with the consumer-generated revenue share (42%). The main methodology used for this purpose is VoC (voice of the customer), preferred by 47% of CEOs and 56% of Financial Directors. Tougher regulatory requirements and multiplication of information channels have recovered in favor of the customer the information advantage previously enjoyed by the companies. Customer focus has become a priority for all companies. Aligning and delivering products / services around customer needs is the most powerful way to increase the value of the company.